The patient presented for scar revision 8 months after Mohs excision of BCC of the nose and closure with an ear skin graft, performed elsewhere. Patient presents for correction of the atrophic erythematous skin graft scar. 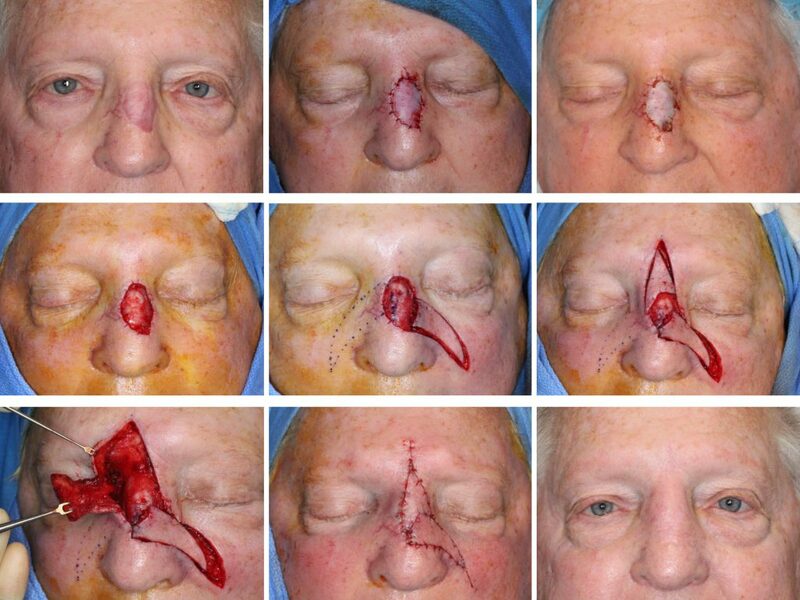 The patient was treated with two signature flaps of the SCARS Center developed for nasal reconstruction. The scar was excised and submitted for histologic evaluation to rule out residual basal cell carcinoma. The wound was closed temporarily with a porcine xenograft. When clear margins were confirmed 1 week later, the defect was reconstructed with two myocutaneous island flaps. The rationale for histologic evaluation of the excised skin graft with delayed reconstruction is important. Placement of the skin graft after oncologic resection in some cases represents an uncertainty about the resection margins. The large defect had extensive margins, increasing the likelihood of omission error on margin evaluation. Reevaluation for residual or recurrent carcinoma is warranted 8 months later. This is especially important before a complex reconstruction. The reconstruction of this large 3 x 2.6 cm nasal defect was performed with two signature flaps of the SCARS Center as developed by Simon Madorsky, M.D. These flaps permit a single stage reconstruction of nasal defects traditionally treated with multistage regional flaps such as a forehead flap. The lateral extended nasal island flap (LENI flap) was advanced 1.8 cm medially to close the inferior portion of the defect. The superior extended nasal myocutaneous island flap (SENMI flap) was advanced 1.5 cm to close the remainder of the defect.